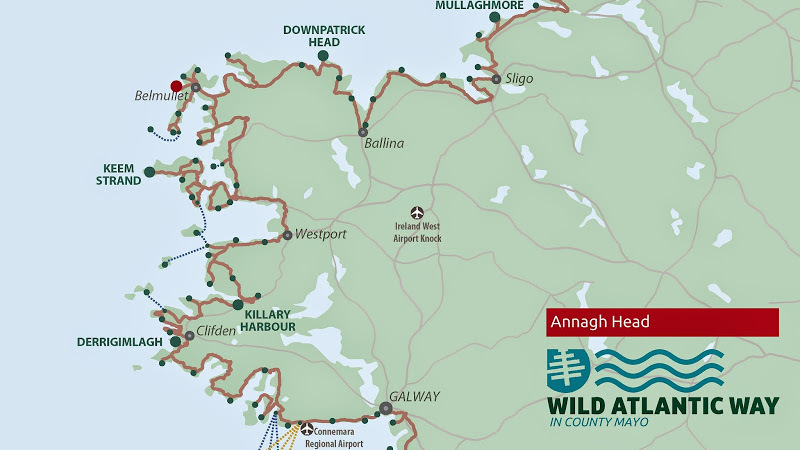 Annagh Head, on Mullet Peninsula, is one of the most ancient sites on the Wild Atlantic Way. The oldest rocks on mainland Ireland are to be found here. The gneiss here is 1,753 million years old, a little younger than that at Inishtrahull. From here you can spot the small island of Inishglora, where, according to legend, the Children of Lir were buried. Inishglora island is also known, because Giraldus Cambrensis (1146-1223), a medieval clergyman and a chronicler of this time, tells about a legend that belongs to this island in his work Topographia Hibernica (Topography of Ireland).